This is based upon the Extended version, so I guess that makes this Big-ger? Big is a brilliant example of the right guy in the right role. 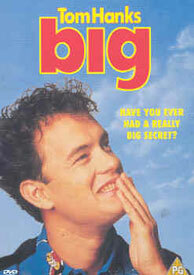 I think Big was always going to end up OK, but with Tom Hanks as Josh Baskin; the child in an adult’s body, it ascended to all time greatness. 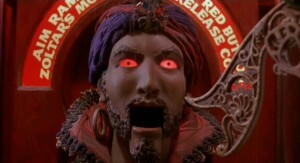 As mentioned above 13 year old Josh Baskin makes a wish at a fairground on an old attraction named ‘Zoltar’, that results in him aging two decades or so overnight – Charlie Sheen seems to have made the same wish judging by his recent photos – but in Josh’s case being a teen 30 something isn’t that easy. How did the 90210 kids manage to pull it off? His parents obviously don’t understand how the rosy cheeked boy vanished and why the rosy cheeked Tom Hanks type ended up in their living room so they call in a kidnapping and the cops show to pick up the trail. The only person who knows Josh’s true identity is his still 13 year old friend Billy, an obnoxious boy with poor judgment. You know, the Lindsay Lohan type… ‘what she’s in her 20s!’. Now expected to be a contributing member of society even though he still wants to play with toys, collect baseball cards and peek at girls (even when he hasn’t the first idea what to do with them), Josh moves to New York and takes a room at a seedy inner city hotel. But staying there long enough to track down the Zoltar machine requires money, so Josh gets a job at… a toy store. Awesome. Though it must be said it is in the IT department not the actual store. Of course Josh is promoted to some sort of executive role as a ‘toy tester and developer’, a role that he is uniquely suited to and attacks with gusto. His newfound promotion is accompanied by a new bigger salary – Josh moves into a plush apartment furnished with décor a kid would choose if they had Dakota Fanning’s change purse – and more attention from Susan. Now a little more content and settled into this ‘easy being an adult’ thing, Josh seems to forget his recent past, including Billy and his family. Will he forego his teens and twenties and fast-track his way to middle age, or will he find a way back to his bunk bed and pet hamster? Hanks’ performance carries the film, you can really believe at times that he is a trapped kid, and there are frequent reminders of his 12-ness in any case that are both charming and hilarious – a scene in the toy store between Josh and the boss stands out instantly. There are funnier films from the 80s (Coming to America), there are more memorable comedies from the 80s (Back to the Future, ET) but there are no films more charming and likable from the 80s. Big announced Tom Hanks as a genuine actor and not a hammy Ferrell wannabe (even though Ferrell didn’t exist yet). The following few years saw him become the most bankable leading man in comedy, the years after that saw him take home his Oscars – as in plural – nothing I have seen since suggests that he is any less funny or any less talented than he was in 1988 when Big was released. But even with the Oscars, the paydays and the universal acceptance there hasn’t been a role so tailor-made for Hanks since Josh Baskin. Anyone else in the role might have seen it work, but Hanks made Big truly great. Final Rating – 8.5 / 10. The extended edition is no upgrade, get the original Big, the one that doesn’t remind you how crap it can be to be an adult and instead focuses on how cool it can (and should) be to be a kid.